Footnotes: Population is 2015 Census estimate. Nassau County (/ˈnæsɔː/ or /ˈnæsaʊ/) is a county in the U.S. state of New York. At the 2010 census, the county's population was 1,400,000 estimated to have increased to 1,400,514 in 2017. The county seat is Mineola and the largest town is the Town of Hempstead. 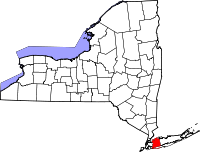 ^ a b "State & County QuickFacts Nassau County, New York". United States Census Bureau. Retrieved March 29, 2017. 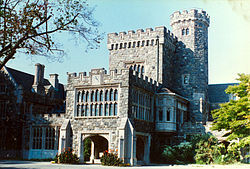 ^ "Deputy County Executives | Nassau County, NY - Official Website". www.nassaucountyny.gov. Retrieved 2017-01-24. ^ Leip, David. "Dave Leip's Atlas of U.S. Presidential Elections". uselectionatlas.org. Retrieved 2018-10-23.